As skywatchers and scientists converge on a transcontinental band of totality for Monday’s solar eclipse in the United States, engineers in Europe are building a unique pair of satellites to create artificial eclipses lasting for hours — a feat that that could be a boon for solar physicists but will escape the view of Earth-bound spectators. The European Space Agency’s Proba-3 mission, scheduled for launch in late 2020, is made possible by two satellites, one about the size of a refrigerator, and another slightly smaller spacecraft with the rough dimensions of a coffee table. The basic idea is to fly the smaller satellite directly between the sun and the field-of-view of cameras and instruments mounted on the bigger spacecraft, blocking the sunlight and revealing the glow of the sun’s corona, or super-hot atmosphere, and filament-like eruptions called solar flares. The light coming from the surface of the sun is a million times brighter than the corona, requiring special measures to see the solar atmosphere. The concept of obstructing the brightest light emanating from the sun to study activity around it is not new. Scientists have made observations of the corona for centuries during solar eclipses, and there are other space missions that carry coronagraphs, light-blocking discs buried inside telescopes used to make the relatively dim solar atmosphere visible. But coronagraphs mounted inside telescopes are prone to stray light, a common problem in optics. Light escaping around the coronagraph disc can distort or mask views of the corona. One simple way to think of the stray light problem is to compare an image of a total solar eclipse, a spectacular phenomenon where the faint corona suddenly springs into view. Holding your thumb over the sun at arm’s length does not produce the same result because sunlight has already been scattered by particles in Earth’s atmosphere. “One of the science goals of Proba-3 is to reproduce the conditions of a total solar eclipse as much as possible,” said Andrei Zhukov, principal investigator for Proba-3’s coronagraph at the Royal Observatory of Belgium, in response to questions from Spaceflight Now. In general, the longer the distance between an observer or a camera and the object obscuring the sun, the better the result. Scientists also do not have to worry about atmospheric distortions in space. “This problem can be minimized by extending the coronagraph length, the distance between the camera and the disc, as far as possible – but there are practical limits to coronagraph size,” Zhukov said in an ESA press release. The duo will launch together into an highly elliptical, oval-shaped orbit around Earth taking the satellites as high as 37,611 miles (60,530 kilometers) and as low as 372 miles (600 kilometers). 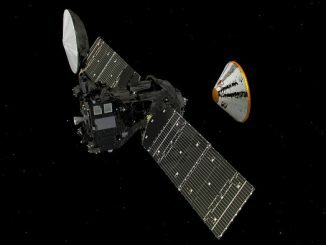 In that orbit, the satellites will complete one lap around the planet every 19.6 hours. For six of those hours, cameras on Proba-3’s larger satellite will have an artificial eclipse. 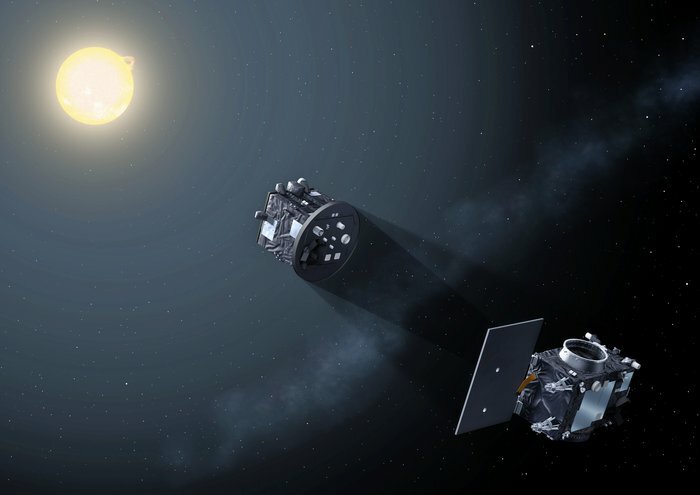 Proba-3 will see the features down to 34,500 miles (55,600 kilometers) from the sun — about 8 percent of the solar radius — resolving activity closer to the solar limb than any current space mission. Zhukov said ground-based observers looking at a total solar eclipse can still see more of the corona than Proba-3, but the advantage of a space mission is the eclipse’s longevity. “During two years of its nominal mission, Proba-3 will provide around 1,000 hours of coronal observations,” Zhukov wrote in an email to Spaceflight Now. “This has to be compared with several minutes of duration of ‘natural’ eclipses during the same time. 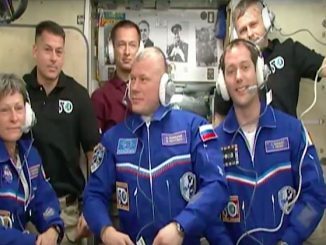 “Proba-3 will also be free from disturbances produced by the Earth’s atmosphere in all astronomical observations,” Zhukov wrote. 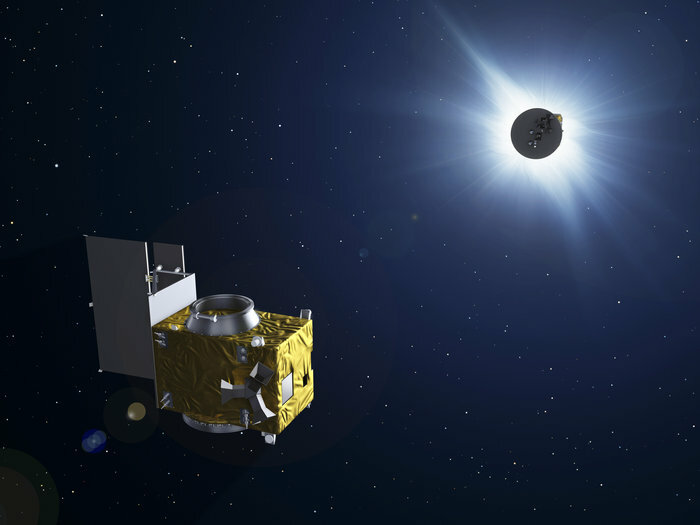 ESA is developing the Proba-3 mission as an experimental demonstration, with scientific observations of the sun a secondary goal. Engineers want to test out technologies for autonomous formation flying on Proba-3, which will use ranging measurements with the help of GPS navigation signals and optical sensors. The two spacecraft will be connected with an inter-satellite radio link, and the so-called occulter satellite — the smaller of the pair — will carry low-power micro-thrusters for fine maneuvers, keeping the two vehicles positioned with millimeter precision. Proba-3 will create an eclipse when the satellites are farthest from Earth. The satellites will passively drift apart during the rest of each orbit, a fuel-saving measure to minimize consumption of the mission’s limited supply of propellant. The capabilities to be proved out on Proba-3 could be used on future missions to repair satellites in orbit or return samples from Mars, according to ESA. Already approved for development as a tech demo mission, Proba-3 won the backing of ESA’s science program committee earlier this year. The agency’s scientific division will pay for Proba-3’s science operations center to ensure astronomers get the most out of the project. 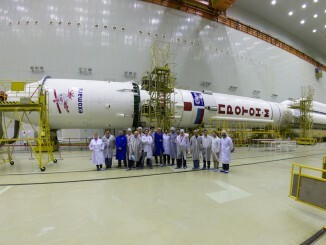 Proba-3 was scheduled for launch in 2019, but officials recently pushed back the mission’s liftoff to the fourth quarter of 2020.